We love fishing and love salmon fishing most of all. When we're not out on the water, wading among the rocks, standing on the bank, or rigging up bait to catch an Alaskan king salmon, we're wishing we were. Reds, blues or silvers; Chinook, Sockeye, Coho, Pink or Chum—whichever name you prefer for whichever type of salmon you like to catch, we love to fish for it, and we love to talk about it. Freshwater fishing or saltwater fishing, it doesn't matter. So welcome again to wildsalmonfishing.com! Come on in. We're open all year long! 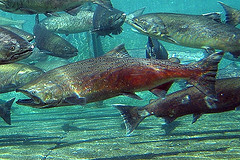 Salmon fishing in freshwater entails use of different bait—either the bait or the rigging of it–than in saltwater. We know that, and you know that, too. That's why we never use strictly saltwater bait while dipping lines in freshwater, and we never tell you it's the thing to do. If something works well in both, we do tell you that, though. What bait works well and why—that's what we talk about. You don't want to know what flies work well when you want to cast bait, and we don't mix the two here—or in the water. 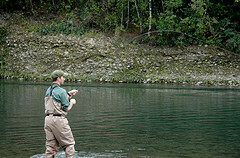 Casting rods are different from fly fishing rods. Nets that work in rivers when you're wearing your waders may not work as well when you're in a boat. Reels are purpose-oriented, and not all poles are created equally. We love to talk about the gear we use and what others are using, what works and what's not this year, and what works in some regions but not so well in others. Depth finders, bottom mappers—or whatever you call them locally—and other gadgets our non-fishing friends and family scoff at can be important in successful salmon fishing. Waterproof watches are nice, too, but those aren't strictly 'fishing equipment' for most people. Deep water or shallow water, quick water or slow, your equipment can make all the difference on boasting about strikes or just telling fish stories. Lures, spinners, jigs or plugs—what tackle you want depends on where you're salmon fishing, what time of year and what you want to catch. We know that, and you know that. Lines are what you use to hold the hook and the pole together; you won't get a lot of 'lines' here telling you otherwise. Line material, strength and weight affect success or failure once you have the salmon on the hook. 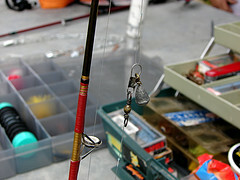 Keeping the fish on the line is virtually impossible if you don't have the right fishing line. Tackle boxes themselves have to fit the fisherman. Are you a per-season fisherman or do you like having all your tackle with you? 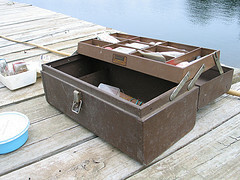 Do you want small tackle box tailored to each fishing trip or do you use one big box for the year? Do you use both? Designs, sizes and storage division choices make the decision either really easy or infinitely more difficult, because selection is the name of the game. Fishing for salmon is both like and unlike any other kind of fishing. Either the fish are biting or they aren't. That's where the similarity ends, though. Salmon are the fish caught not while feeding like every other kind but by aggression. The key between mediocre trips and fantastic trips is whether you hold their attention closely enough and for long enough to get a strike on your line. Are you action-oriented or do you prefer a more relaxed experience? Do you feel luckier if you cast flies, bait or metal and plastic? How does trolling differ from jigging? Is it realistic to go salmon fishing 800 miles upriver? Sometimes, it is. Sometimes, it's not. It all depends on how you go about it, which is core to any technique, isn't it? What makes Chinook go into a strike frenzy while Cohos ignore it? When does a lighter filament work better than a heavier one? What's an easy, secure tie for a spinner that kills plug action, and why do you want action with a plug, anyway? 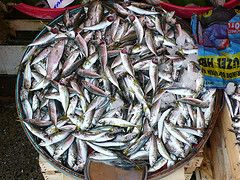 When does fresh bait work better than frozen or vice versa? What fly fishing technique can work miracles in nudging a salmon toward striking on a jig rig? How do you reel in a 30-pounder on an 8-pound test line? Tips, hints, and secrets that we don't share with catfish hunters or bluefish anglers are yours for the reading, casting and reeling. Let us know if you have tricks you'd like to share, because we would rather talk about salmon fishing more than we would about football!